Without a doubt, the sexiest word in my scientific vocabulary is viscosity. Without comprehending the outrageous complexity of the term, Mike and Brooke and I met up in Davis to do some real-world testing. Our method, not unlike Sir Walter Raleigh and his "futbals" at the top of the Eiffel tower, was to drop balls through liquids and record the amount of time it took for the balls to fall. 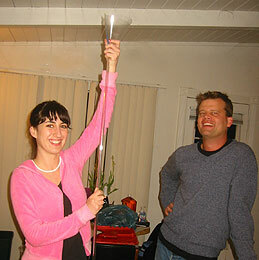 Our testing apparatus included a funnel, a stop watch, steel ball-bearings and a clear six-foot plastic tube. The long plastic tube was hard to locate, but we finally tracked it down next to the indoor gardening equipment at Mary Jane McPuff's Superpipe Headquarters. The first liquid we tested was plain tap water. We dropped a steel ball through the water and timed how long it took to reach the bottom. It took 3 seconds for the first one, 2.74 seconds for the second and 2.71 for the final ball. We emptied the tube and prepared the second liquid. 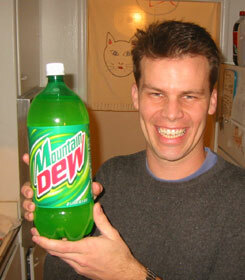 This one was slightly thicker than water: Mountain Dew. Mountain Dew is produced by the Pepsi-Cola company using only the most extreme ingredients, such as corn syrup and gum arabic. How a product with such an absurd name ever became such a popular drink is completely beyond me. The only thing more absurd is the list of copy-cat Mountain Dew store brands: Mountain W, Sunshine Mist, Mountain Mist, Mountain Best, Sun Drop, Citrus Mountain, Mountain Lightning, Jolt Citrus Climax, Mountain Breeze, Sierra Mist, Tops Mountain, Citrus Mist, Yellow Lightning, Citrus Dew, Mellow Yellow and Hee Haw. Look for more combinations in the future, such as Mountain Yella, Mt. Dewey, Splash Mountain, Saddle Mount'n, Fountain Dew, Hillbilly Yella, 4X4, K2, Mosquito Repellent, Mount Rushmore, Anti-freeze, and Dueling Banjo. 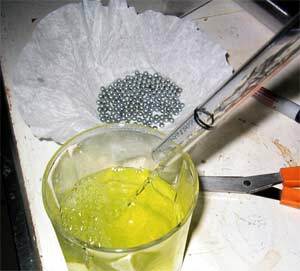 The Mountain Dew fizzed as carbon dioxide gas came out of solution. 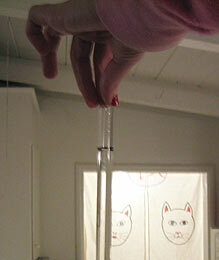 As the bubbles reached the top of the column, we watched as the fluid level dropped before our very eyes. Cool! We topped it up to the black line and started dropping BBs. Times were similar to the pure water: 3.17 seconds, 3.52 seconds and 2.96 seconds. Mountain Dew is clearly thicker than water, but the rising bubbles seemed to have an effect on the falling balls. Furthermore, balls in pure water simply fall, whereas they seemed to be sky-surfing through the Mountain Dew. Mike photographing the falling BBs. 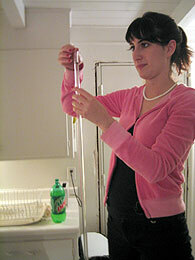 After the Mountain Dew, we tried to measure the viscosity of Heineken Beer. I was excited to find out if liquor was quicker. 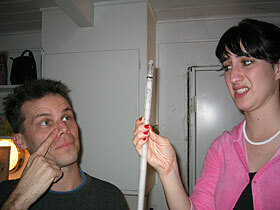 Unfortunately, pouring beer into the tube released thousands of bubbles, forming almost four feet of foamy head. I offered to break down the foam with oil from my face, but Mike and Brooke didn't like that idea. 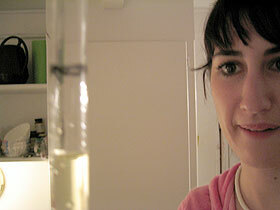 We dumped out the Heineken and opened the next fluid for testing: Goldschlager. Please read Testing Viscosity Page Two. Last updated March 9, 2003.